Keith's Odyssey to Planet Fitness: The skies here are wow! I wanted to get some nice photos of the southern hemisphere. After all, I might never see it again after this trip. Lots of things need to come together for a shot like this. No clouds, and preferably no moon. A nice place to shoot from. 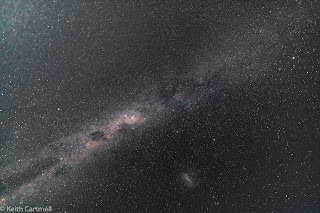 Dark skies without light pollution from nearby cities. 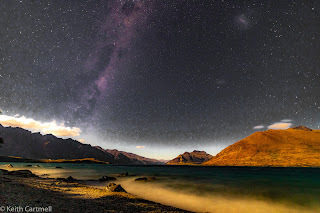 New Zealand has all that, if you're in the right place at the right time. We got into Queenstown yesterday (which is tomorrow for most of you) to cloudy skies. We went to bed to cloudy skies. I woke up about 1:30 with the wind howling in the open window. When I looked out I saw stars. I scuttled about to get my camera stuff, and walked down to the beach just behind us. Nothing special as beaches go, coarse gravel, but it got me in the shadow of a half moon, and out of the wind. Some playing with settings, and here you are. The first one is looking over Lake Wakatipu towards The Remarkables. The second is looking straight up. Forecast is good for clear skies tomorrow night, and I'll be scouting locations. I have high hopes.